It is the responsibility of your organisation to identify what training your staff and volunteers need and to ensure that they receive adequate and appropriate child welfare and protection information and training. The e-learning programme can be accessed here. Tusla has also produced guidance to assist organisations developing their own specific Children First training. 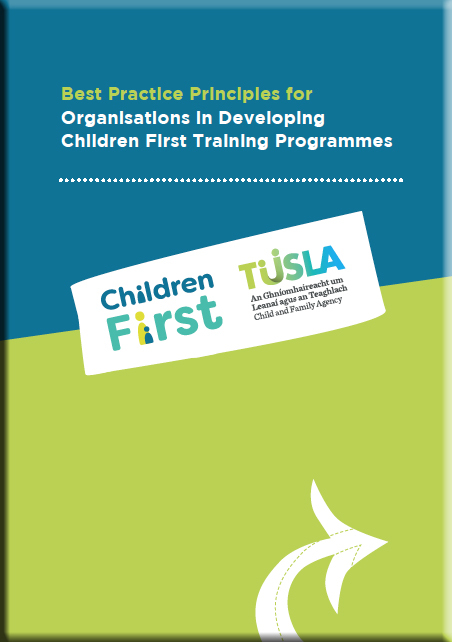 Tusla's Best Practice Principles for Organisations in Developing Children First Training Programmes can be accessed here. Tusla employs Children First Information and Advice Officers who are available to liaise with voluntary and community organisations and provide advice and guidance on Children First 2017. They can also help with any queries about child protection and welfare training. Contact details for your local Children First Information and Advice Officer can be found here. It is the responsibility of Government Departments to ensure that children and young people are kept safe while accessing services provided or funded by each department. If your organisation falls under the remit of, or receives funding from, a Government Department, please note that you have an obligation be are aware of and comply with Children First legislation and Guidance. Please see www.dcya.ie for further information.